When Dale Clifton was 14 years old, he had a vivid dream about finding a coin on the beach. The dream was so clear that the teenager went out and bought a metal detector and started searching for coins along the Delaware coast. Little did he know that his vision would eventually lead to a lifetime of hunting for history. I found my first coin on December 17, 1977, Dale says, standing in the middle of his DiscoverSea Shipwreck Museum on Fenwick Island. Incredibly, this one-man salvage operation has discovered more than 200,000 coins and 30,000 other marine artifacts since then. Using mainly preliminary research, scuba gear, and a small boat, Dale has gathered one of the world's largest privately owned sunken treasure collections. 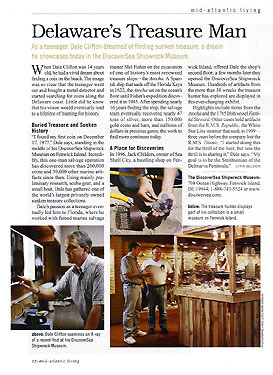 Dale's passion as a teenager eventually led him to Florida, where he worked with famed marine salvage master Mel Fisher on the excavation of one of history's most renowned treasure ships--the Atocha. A Spanish ship that sank off the Florida Keys in 1622, the Atocha sat on the ocean's floor until Fisher's expedition discovered it in 1985. After spending nearly 16 years finding the ship, the salvage team eventually recovered nearly 47 tons of silver, more than 150,000 gold coins and bars, and millions of dollars in precious gems; the work to find more continues today. In 1996, Jack Childers, owner of Sea Shell City, a bustling tourist shop in Fenwick Island, offered Dale the shop's second floor; a few months later they opened the DiscoverSea Shipwreck Museum. Hundreds of artifacts from the more than 30 wrecks the treasure hunter has explored are displayed in this ever-changing exhibit.